Gamemaster1379 is an alias that stems back many years. When my home got one of its first internet providers back in 2006, I quickly sought out an online community to take part of. Prior to becoming a PC gamer, I primarily focused on console gaming. Having grown up on Nintendo consoles, I found myself at the Nintendo NSider Forums. Uncertain of what to name myself, I attempted to give myself an ambiguous name. Ironically, without much thought, I came up with Gamemaster. Obviously being a common name and taken, I decided to add the numbers "1379" to it. Many have asked what it means or represents. The reality is, it doesn't really represent anything. It's just the corners of the number pad. About one year was spent on the Nintendo Nsider Forums until its close in September 2007. Following that, a number of fan communities spawned in its place. Being an enthusiast of the community and its sub-culture, I followed and became moderator staff for a number of them. In the end, the Nintendo Nsider2 Community became the dominant community. I became a moderator, and later on, the lead administrator for this community. For a time, I was Gamemaster1379, but later became known as simply "Matt" by the community. I served the community from late 2007 until my resignation in early 2011. During my time there, I co-founded MREOMusic as an affiliate of Nsider2. In late 2009, I was introduced to PC gaming by a fellow staff member from the Nsider2 community. I was shown the client Steam, and introduced to Team Fortress 2. Specifically, I was introduced to the OverClocked ReMix Gaming Community's Team Fortress 2 Server. Inspired by a friend who played Engineer and showed me his antics, I was drawn to be an Engineer main. I became a regular at the OCRemix TF2 community. At the time, I only ever thought I would just be a casual player only. I never expected to involve myself as much as I did in the game or the community. I currently reside as lead administrator over the VictoryPit/OverClocked ReMix TF2 community. I work as the technical administrator to handle backend on the Mumble and TF2 server as well as frontend in organizing weekly events. Recognized for my abilities by a friend from the Steam Powered User Forums community, I was approached a number of years ago to assist with a friend's team. In Highlander competitive, Engineers were hard to come by and his team's had left mid-season. While I didn't have that much interest in competitive and did not think I was qualified, I agreed to play the remainder of the season--just to see how it went. I made my debut that season on The WILD Party in UGC Highlander NA Steel Season 7. I ended up staying with that same team all the way through to Season 11 to which we finally had a mutual disband in Season 11. Following the disband, I took another season in Gold with TheFryingDutchman, and then moved to NA Platinum. I was in Platinum for both seasons 13 and 14 for Pregame Tryhards and Death Marked Soldiers respectively. In season 15, I returned to Gold under recruitment by Squirtle Squad, a team that went on to win Gold that season. Before returning to Platinum, I took the season after to offclass as a Medic in NA Silver on PTFO in Season 16. After, I returned to Platinum to lead my own team in Season 17 by the name of Wartortle Warriors. The same friend who brought me into competitive is also responsible for nominating me on behalf of the Steam User Forums for Community VS Pros 5. CvP 5 was an event that prepped a team of Highlander players against an ESEA-I 6s team. The event was broadcasted on the front page of Twitch.tv. 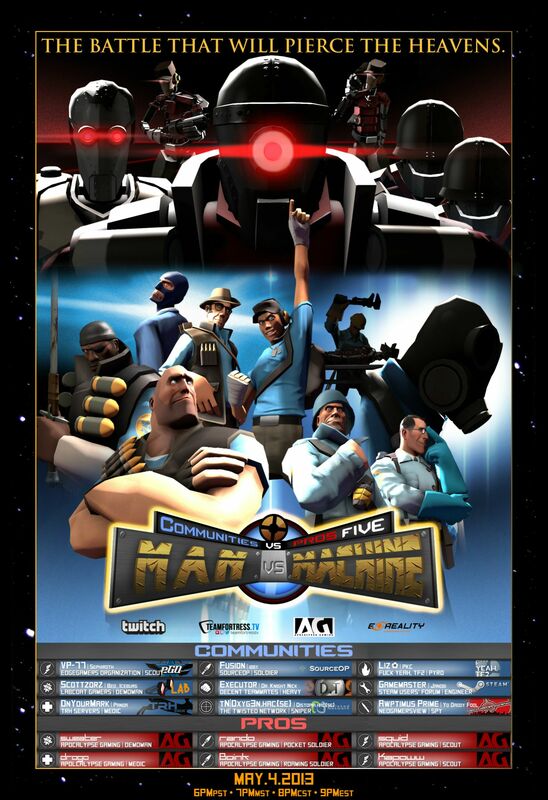 In addition to competitive play, I also became interested in other aspects of Team Fortress 2. I was intrigued in how the game worked, and even discovered a number of major economic exploits--one of which allowed the use of custom RGB values for paints and also allowed for the use of items as keys. I have dabbled around with a lot of user-made modifications in Team Fortress. In particular, my specialty was with player animation sets. Cooridinating with an animator, I made use of his animations to come out with Improved Taunts Mod, an animation project that allowed use of custom animations almost three years ahead of Valve was able to officially implement it. At present I am currently managing a competitive team in NA HL Platinum under the name Wartortle Warriors. Being both a player and a leader demands I put a lot of time towards Team Fortress. However, in my downtime, I have been playing both Killing Floor 2 and Guild Wars 2 as of late.